Go Hands-free with the next generation BlueParrott bluetooth headset. 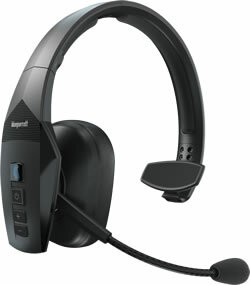 The B550XT headset allows drivers to keep in touch while staying within the lines of the law. Once paired with your smart-phone, GPS, CB or other bluetooth device, you'll have a range of up to 300 feet where you can roam from the connected device. The Industry Leading Noise Cancelling Design works to eliminate 96% of background noise allowing you to be heard in crystal clarity no matter what high-noise environment you work in. Enjoy comfort and convenience in a truly hands-free experience. Extra padding has been added to the headband and the cushioned ear-cup has been perfected for all day wearing comfort. Weighs just three quarters of one pound (0.75lbs). There are just three buttons and the rest is controlled totally by simple voice commands. With the B550XT you will likely never be cut short. A long-life built-in rechargeable battery provides up to 24 hours of talk time and 400 hours of stand-by time. Fully charges in approximately 3.5 hours. If this will be your first bluetooth headset we strongly advise using it around the house for a day or so. Doing so will help you learn the B550XT and become comfortable using it before hitting the road.